OUT OF THE BOX: Louis van Gaal's tactics during the world cup were astute. SAO PAULO: Win or lose Wednesday's semi-final against Argentina, Netherlands coach Louis van Gaal will leave the World Cup having firmly reinforced his reputation as a master tactician. Manchester United fans must be feeling on excellent terms with themselves at the prospect of seeing the distinctive 62-year-old's presence filling the Old Trafford dugout in a few weeks time. But before he swops his orange tie for red to direct his prodigious grey matter to reviving United's fortunes, van Gaal has unfinished business in Brazil. 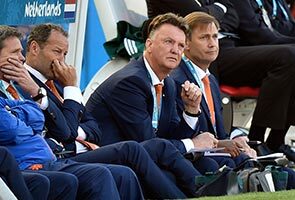 After Holland's 2-1 last 16 comeback win over Mexico van Gaal was hailed as the most tactically astute coach in the game by Dirk Kuyt. The way van Gaal switched the former Liverpool forward between three positions in Fortaleza as circumstances required illustrated his thinking-out-of-the-box approach. As did the way he exploited the cooling breaks in that match to make tactical switches. But for sheer audacity it was hard to beat his switching of keepers to bring on Tim Krul for Saturday's quarter-final penalty shoot-out - the Newcastle shot-stopper repaying the coach's daring move by stopping two Costa Rican penalties, to put the Dutch in the semi-finals. A disciplinarian who has rarely lacked confidence in his own ability, van Gaal has won domestic titles and cups with Ajax, AZ Alkmaar, Barcelona and Bayern Munich as well as guiding Ajax to Champions League glory. On his United appointment the Dutch media offered their British cousins 10 tips to follow when interviewing the new United manager. "Congratulations on obtaining Louis van Gaal," the advice began. "From this moment on, you will be patronised, looked at with disdain, and haunted by a constant doubt if Mr. Van Gaal is flat out making fun of you or being dead serious." That'll certainly make a difference to Moyes' ever polite and apologetic turns in front of the press in his ill-fated spell as Alex Ferguson's replacement. "Bravo, you've signed the best coach in the world," is what van Gaal is reported to have said after being promoted to head coach at Ajax in 1991. After his latest exploits in Brazil, United fans will be saying the same thing.